The Nittany Leathernecks are always looking for a few good volunteers. Our approach to this effort emphasizes organizational support. But we (indeed) also welcome individual volunteers. The emphasis, however, remains TOTAL community involvement. Each year a corporate sponsor helps support the program effort. 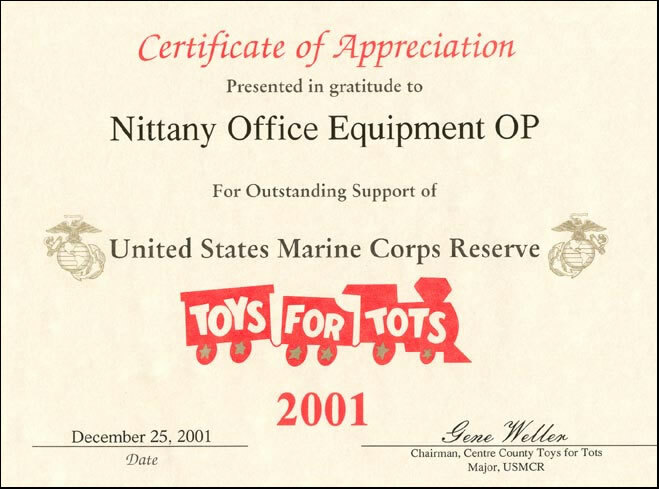 Sponsorship allows the detachment to maintain its own web site which contains essential information relative to the annual Centre County Toys for Tots campaign. Behind the Scene - An almost year-long effort ensures the critical three week execution period is successfully conducted. The Nittany Leatherneck's motto - "Valiant service is not limited to combat." Organization Support - The Nittany Leathernecks Detachment sponsors and encourages group organizational support. The Nittany Leathernecks serve as the program facilitator. Members rarely interface with actual benefactors of the program. Only on rare occasion does that happen. Working closely with the Centre County Adult Services Office, Pennsylvania State Police Foster Child Program, and the State College Elks Club, the detachment is the conduit for collecting, wrapping, sorting, and logistically delivering toys to the service agencies (noted above) that provide the actual distribution. Needs established by the Centre County Adult Services Office are provided to the detachment. The detachment then provides four items for each child/young adult. These items include toys, books, games, sporting equipment, and other appropriate articles for young adults such as jewelry, watches, radios, backpacks, etc. Generally speaking, two of the four items received will be quality items the child/young adult can particularly enjoy. Each year the annual campaign ensures that over 3000 less-than-fortunate Centre County children enjoy the holiday spirit. The Centre County Toys for Tots campaign accommodates religious protocols (in concert with economic eligibility) for Christmas, Hanukkah, Ramadan, and Kwanza during the December-January holiday season. The actual execution of the process takes place in a remarkable two-week time window. Additionally, other social service agencies are provided any leftover toys that remain. To execute the logistics, and also provide a safety net to catch those needy children who may fall through the crack at the last minute, the Nittany Leathernecks have enlisted the help of local fire and police units. Fire companies throughout the county provide transportation from the wrapping/distribution site to the area food banks. The distribution we are talking about includes an average of approximately 14,000 toys each year. Local police units each receive a cache of toys so that any short-notice calls for help can be handled immediately especially, for example, on the eve of Hanukkah or Christmas. The use of police personnel for last minute situations is unique. The Nittany Leathernecks feel it is important for young kids (and parents) in economically disadvantaged homes to develop positive interactions with local law enforcement personnel. Letting police units close the final loop is a unique opportunity to create a positive encounter. It is a win-win situation for all concerned. Each year during the campaign toy donation collection sites are set up throughout the county at various collection points. At these sites, large red collection barrels are made available from Thanksgiving Day until approximately one week before December 25th. Established sites include those noted here. Toy donations should be new, unwrapped toys for infant through young adult (13 and above). Do not waste time wrapping gifts since they will be unwrapped and inspected before being rewrapped and distributed to the supporting food banks or designated distribution organization. Cash donations are always welcome. These donations provide flexibility in terms of filling age/gender shortfall areas that the actual toy donation collection effort fails to cover each year. Traditionally, shortfall areas include infant as well as young adult (13 and above). Checks or money orders are preferred by those desiring to make contributions. Please make checks or money orders out to "Marine Corps Toys for Tots Foundation". ALL cash donations received by the Nittany Leathernecks are sent to an account held by the national headquarters located at Quantico, Virginia. All (100%) money received by the Nittany Leathernecks goes to the Centre County effort. Checks should/will be annotated with "Nittany Leathernecks Detachment" in the memo section before forwarding to the national foundation in order to ensure they are held for the exclusive benefit of Centre County. The foundation provides accountability and protection to ensure no misuse of the funds occur. Absolutely NO member of the Nittany Leathernecks Detachment receives any personal compensation for his/her effort(s) on behalf of the campaign. All contributions made to the Marine Corps Toys for Tots Foundation are tax deductible under the IRS-approved code 501(c)3 "Tax Exempt Organization." The federal identification number (FIN) for the Marine Corps Toys for Tots Foundation is 22-3050009. Each year, the Penn State Athletic Department has identified specific basketball games as Toys for Tots support events. Basketball fans will be admitted at no cost, other than the contribution of a new and unused toy at the entrance gate. The Nittany Leathernecks wish to thank the Penn State Athletic Department for this special support we receive each year. Be sure to indicate the correct U.S. Postal Service mailing address you desire to have information delivered to. You will receive invitations to the annual kick-off breakfast, as well as announcements regarding wrapping schedules and other news. The Nittany Leathernecks Detachment of the United States Marine Corps League, as the authorized organization for conducting a Toys for Tots campaign in Centre County, cannot offer enough thanks to the Penn Stater Conference Center for annually providing space for the processing of 12,000 to 15,000 toys. As this is a working conference center, we must ask that a level of respect and decorum be provided while at the Penn Stater. We believe strongly in the teaching of our children that there are those less fortunate than ourselves, and if we do not show them charity while they are growing up, how can we suddenly expect them to respect others when they are adults. That said, we must ask that children brought to the Penn Stater have sufficient adult supervision as we do not have enough volunteers to keep an eye on children that otherwise elect to run around the halls of the hotel/conference center. Check for age appropriateness and gender. Check and see if it needs batteries and if they are included. Note: if batteries are needed, bring them to the battery table. We want to ensure that a child will be able to use the item when unwrapped. Make sure the bar code is crossed off. This ensures that someone can't try to return the item to Wal-Mart or some other store and get a refund. Put a white sticker showing the contents and either a blue (boy), pink (girl), or yellow (boy or girl) sticker with the lowest age that the gift can be used for and the highest age it can be used for. If the gift is for 18 months to 5 years of age, you would put an age 2 and an age 3 sticker on the gift. Never put a sticker on with an age lower than recommended by the manufacturer or higher than what is recommended by the manufacturer. We must stay with the ages recommended by the companies who make the toys to prevent injury. There should never be more than 3 stickers on any gift and there should never be a mixture of colored stickers on any gift. You will have all pink, all blue, or all yellow stickers; and a white sticker showing the contents. Infant gifts are items that are listed with the ages 0-18 months. These gifts will only get a yellow infant sticker. IF AN ITEM IS FOR A 1-3 YEAR OLD, ONLY PUT AGE STICKERS SHOWING 2 & 3. IF AN ITEM WERE FOR 3 TO 7 YEAR OLDS, YOU WOULD PUT STICKERS ON SHOWING THE AGE OF 3 & 4-6. NEVER PUT A STICKER ON THAT IS LOWER OR HIGHER THAN THE RECOMMENDED AGES. It is our mission to provide four new toys for each child identified primarily via the seven Centre County food banks. These agencies adhere to financial standards set by the county for determining eligibility. The food banks provide us with a list by age and gender of the number of children that they support. At the Penn Stater, two large conference rooms are utilized along with about 4four smaller rooms. The toys are collected in one small room where the bar codes are crossed out and then the toys are placed by category in the next small room. The first large room is where the wrapping and labeling occurs. To reduce confusion, the toys are placed on the wrapping tables by category such as puzzle, or doll. Only that category of sticker will be at that table location. When items run low in that category, more are brought from the second small room mentioned earlier. After the toys are wrapped and labeled, the toys are taken to the second large room that is segregated by age and gender. The toys are placed in the appropriate category from which the orders for each food bank are filled. After counting and bagging the toys for a specific food bank, those bags are then taken to another small room where they are segregated by food bank. Volunteers from the county's fire departments will pick up the bags and transport them to their food bank site.